Who stands atop a hill with strong winds and 36 degree weather talking about wine? I would be guilty as charged. But it’s not a normal occasion to be standing on top of a hill overlooking Chablis, France, with one of the area’s top educators. Our small press contingent had the opportunity this morning to spend time with Eric Szablowski, one of Burgundy’s leading wine experts. 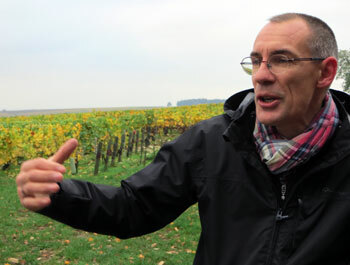 It was darn cold but fascinating to hear why Chablis is so special and different. At several times this morning the group discussion followed a similar pattern. 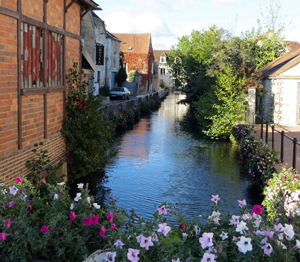 The world knows Chablis as a fresh, clean wine with good minerality – but they can also be quite different. Erik took us into the vineyards and showed us the incredible slopes on the hills around Chablis and nearby villages. He explained the effect of the clay and limestone soils which effect the vineyards and therefore the wines. Chablis is not a large area with 350-400 wine growers and just more than 100 producers of any significant amounts of wine. Additionally, these produces export approximately 70-80 percent of all the wines they make. But to understand how one wine with the standard characteristics can vary to the next Erik explained the terroir. Take the Grand Cru vineyard, for instance. There is just one Grand Cru but there are seven different sub climates within that vineyard area with its slopes, soils, and exposure to the sun. “Eighty percent of the quality of the wine is determined in the vineyard and the other 20 percent by the winemaker,” he offered. We followed up the chill walk around two sections of Chablis vineyards by tasting the 2012 ChablisWine Award winners. We tasted 10 different wines which won mostly gold, and a few silver, medals in the recent competition. The tasting showed the differences slight and significant the Chardonnay grape can produce in this diverse terroir. I hope to add notes on most of the 10 wines later. I did take notes to share because most are available in the U.S. My two favorites were Damien and Romain Bouchard’s Premier Cru Montee’ de Tonnerre and Domaine Drouhin’s Vaudon Chablis Grand Cru. 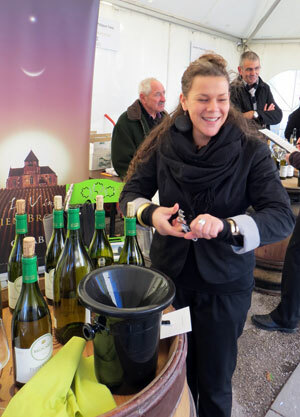 The event we’re here to enjoy is the Chablis Fete des Vins, or festival of wine. There are more than 50 producers pouring their wines, food, and entertainment. Our group translator Isabell Terrillon accompanied me to a number of booths she recommened for visits. Here are a few of my favorites. All of the ones listed here have at least some distribution in the U.S.
Domaine Fevre (Nathtalie and Giles) – I tasted through most of the Chablis with Nathalie who speaks great English. I loved the consistency of her wines with or without hints of old oak. Many of the labels had good bottles but some not quite at the same standard. Her wines were age worthy but showed quite nice as young wines. Domaine Chantemerle Boudin Pere & Fils – A limited selection of wines but also available in the U.S. I loved his two Premier Cru wines at very affordable prices. With a very old-world label they represent the second tier (Premier) well at prices in France of under 20E. 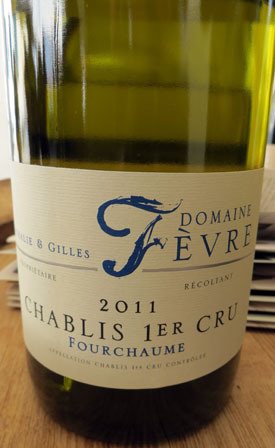 Vins Fins de Chablis (Isabelle et Denis Pommier) – Again very consistent across the four major appelations of Petit Chablis, Chablis, Premier and Grand Cru. Isabelle took time to answer questions and talk about the wines. Another very affordable label even once you add the importing costs and distribution markups for top quality Chablis. Jean-Marc Brocard– This was my first stop of the festival and one of the best. The Brocard name is well known not just in Chablis but around the world. Consistently in elegance and style, the wines were consistently well balanced with great minerality, finesse in winemaking, and reasonably priced. I bought a Premier Cru to bring home. Pascal Bouchard – A great name producing great wines. I like the twist of his sons, who won one of the Chabis Commissions 2012 awards for their Premier Cru Montee de Tonnere label. Romain Brocard poured three different Chablis which I found enjoyable across the board. The Montee de Tonnere was one of the best wines I tasted all day. I did taste at a couple of other booths but found the lines inconsistent or not to my liking.